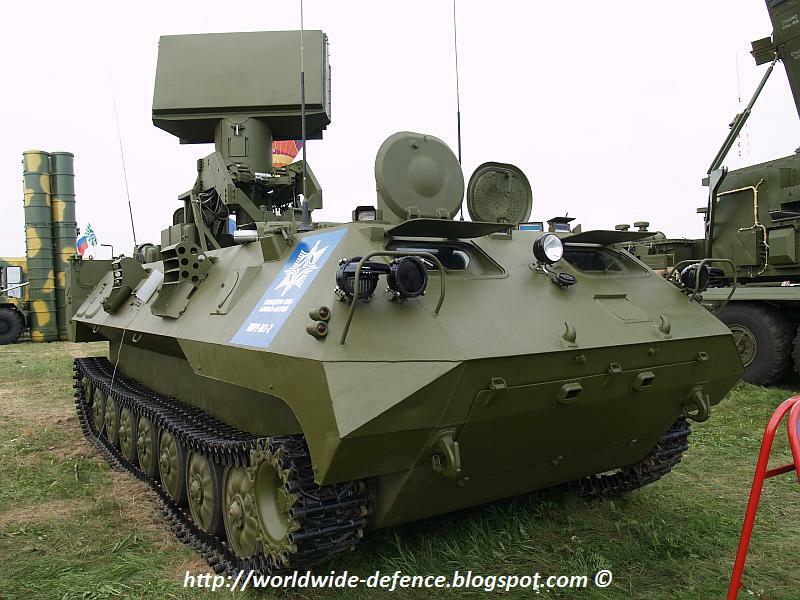 First prototype of the latest self-propelled air-defence system Derivatsiya-PVO is undergoing preliminary testing. Its actually the same pic from post 104 back in August 2017 just with its proper background. I like this thing, proper dual-purpose 57mm will be able to wreck any ground vehicle short of a tank (& probably at least older ones if caught from side/rear), do very useful anti-infantry/bunker work and kill drones/choppers. 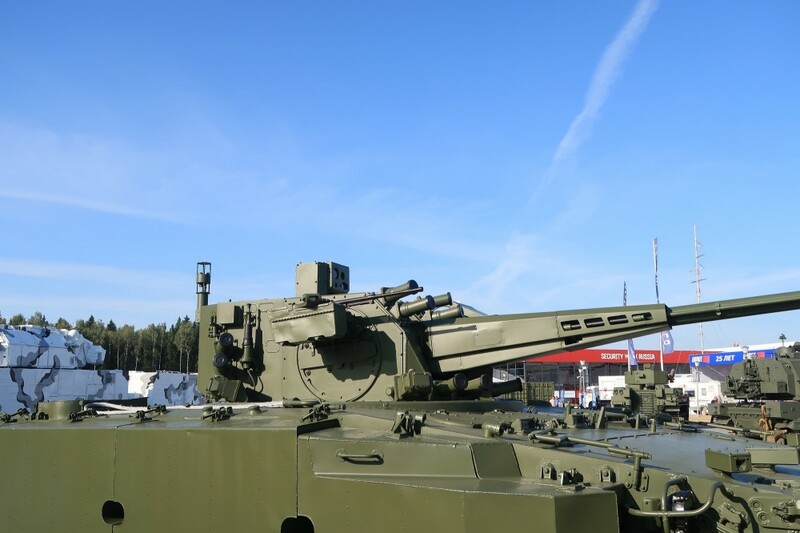 On the one hand it'd be nice to see it gain a bit of range with option to mount pantsir/sosna/kornet missiles as well but it would perhaps make sense to pair it with a Sosna vehicle instead. 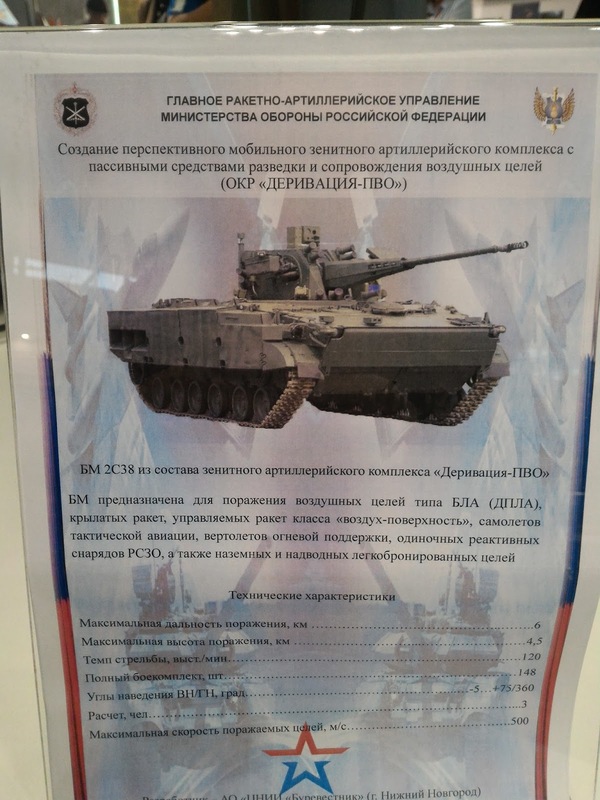 The old question of whether its better to have 2 separate specialised vehicles or 2 with both gun & missile but reduced ammo/sensor setup, seems Russians are swinging towards the former. 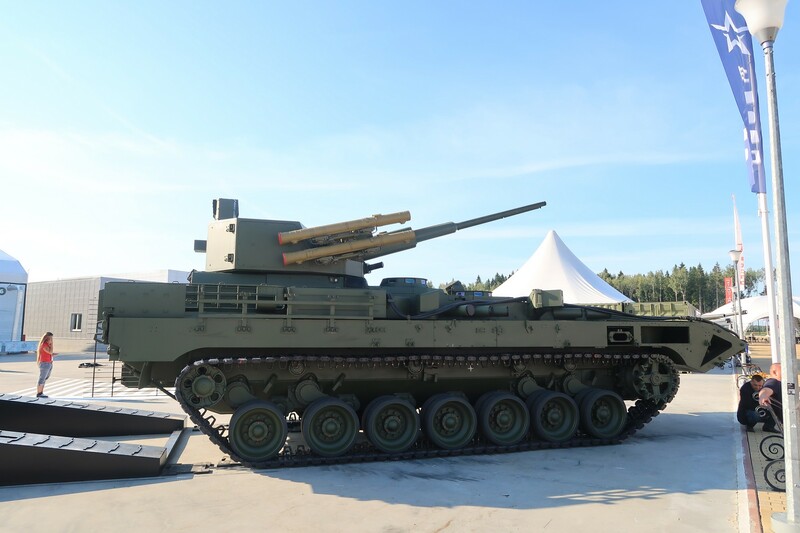 Turret appears to have been significantly revised, looks a bit chunkier, radar is moved into right cheek, chunkier recoil mechanism & other details. So is this only for tracked platforms or could Boomerangs get them? You can have one for your car! Hole wrote: You can have one for your car! 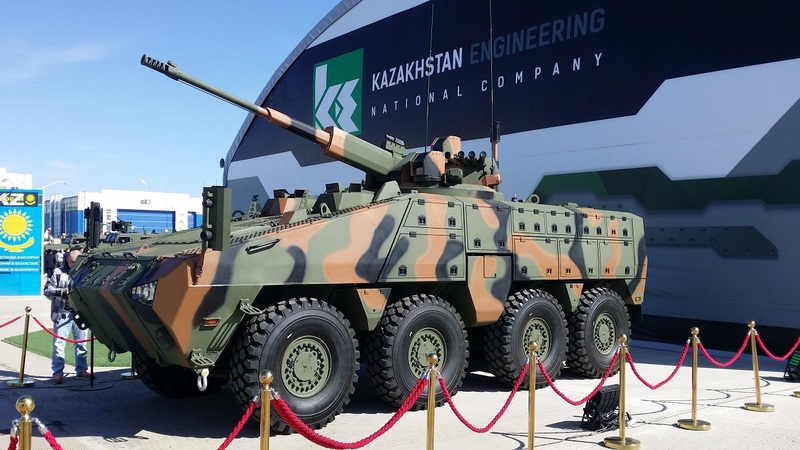 BTW this is Kazakh BTR but as you can see ay-220m fits there pretty well. This is the old turret. New one seems to be heavier. More ammo inside? But it will fit onto the Bumerang. But it will be to big and heavy for the Tigr. What penetration would have an APFSDS of 57mm ? 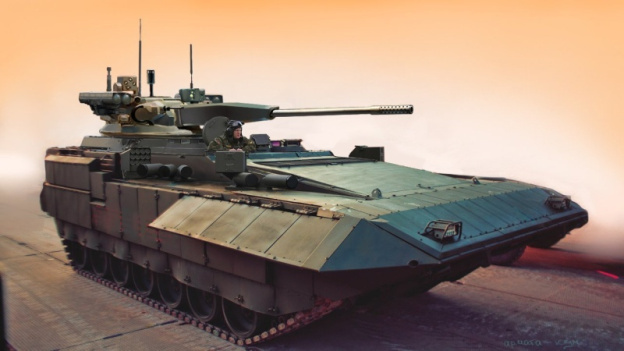 Could it go through the sides of MBT ? Isos wrote: What penetration would have an APFSDS of 57mm ? Could it go through the sides of MBT ? Hole wrote: But it will be to big and heavy for the Tigr. APFSDS rounds do not have miniturized nuclear warheads set to go off once inside the enemy tank in them. They can kill crew within proximity to thier flight path with shrapnell and machinery with what is left of the penetrator. They do not explode, they do not fill the tank with acidic vapor and they do not come alive and strangle they crew of the tank they hit. A vehicle can only be considered dead once it has either been completely dissabled (firepower and mobility) or all crew are killed. And being abandoned is not the same as being killed. If a vehicle is abandonned then it is the crews decision to scuttle the tank and not the direct work of the munitions used against it. In this video you can see that it starts a fire in the car. The penetration produce shrapnells that are very hot. SO according to you APC is OK after a shot form 57mm? or a helicopter or what? According to Wiki the S-60 (as used in Syria) has APCBC with 96mm pen at 1000m, thats definitely capable of penning the sides of the early Cold War era tanks being used there (give or take angle & presence of ERA), might even get lucky on the more vulnerable bits of a modern tank. But pretty much anything else is certainly fair game, few AFVs are armored frontally against more than 30mm (2A42 maxes about 45mm pen). This is the old turret. New one seems to be heavier. Old = first version of the turret. Hole wrote: Old = first version of the turret. GunshipDemocracy wrote: SO according to you APC is OK after a shot form 57mm? or a helicopter or what? Unless the 57mm is an APHE shell or it hits the amunition the APC will not be killed with one shot. I never said it 57mm APFSDS would be ineffective. Just that APFSDS rounds do not outright kill armored vehicles in one hit unless they hit the amunition and even then the vehicle might have blowout panells. I challenge you to outright kill an m1a2 with only 1 Vaccum 1 round. At most you will kill the driver and gunner with additional effects potentially being a fire in the crew compartment which will be extinguished by the automated fire supression system and an amunition fire which will not kill the tank. AU-220M has the increased firing accuracy, the enhanced getting abilities and zapregradny action of ammunition of caliber of 57 mm. The module can have remote control, at the same time the crew has an opportunity to be out of the IFV case. The new product is universal. 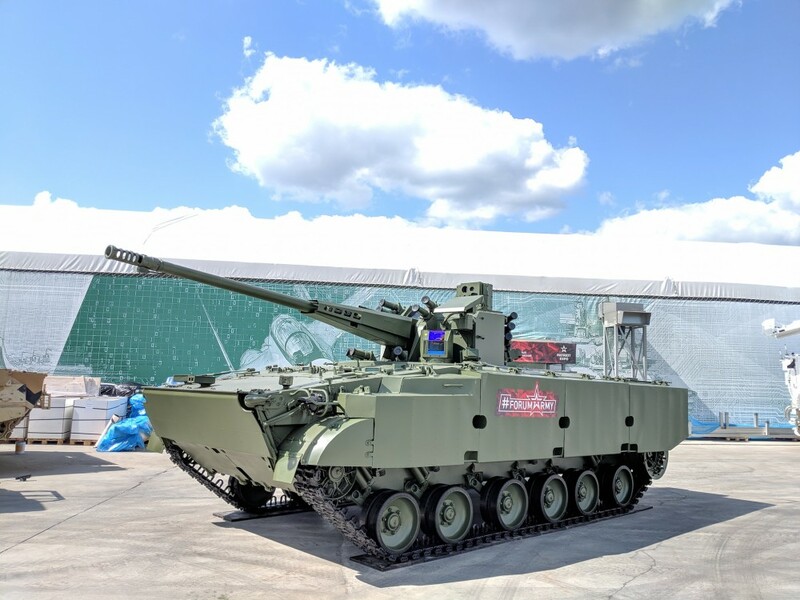 AU-220M can be used together with various existing and perspective samples of armored machinery, is installed not only on Terminator BMP-3, BMPT cars, but also on the perspective platforms "Armata", "Resident of Kurgan-25", "Bumerang" and also on the ships and boats of small displacement. The angle of lead of a trunk of the AU-220M gun is much higher, than at a classical artillery cannon. 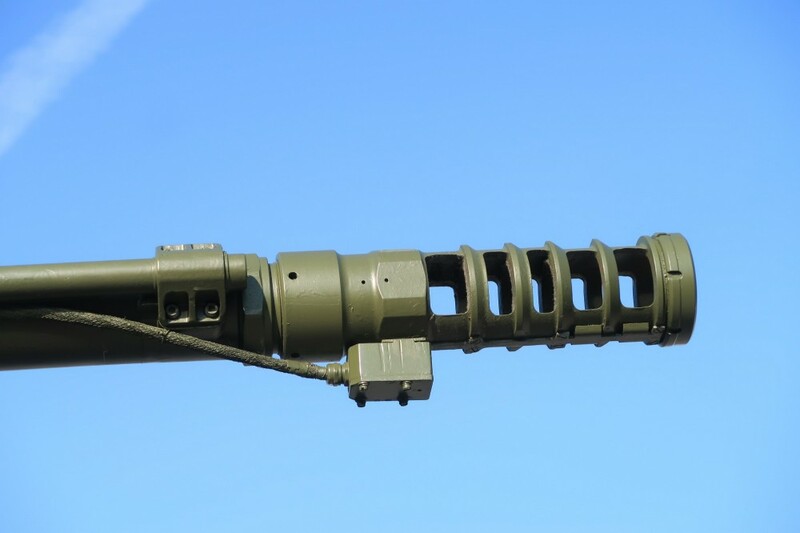 It increases fighting capacity in city conditions and gives the chance to fire on air targets. 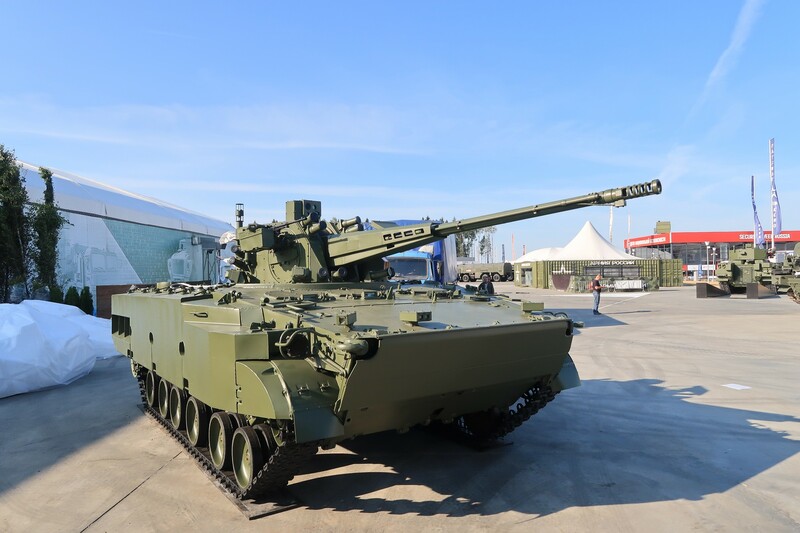 BMP-3 equipped with the new fighting module is capable to fire from the place, on the run and afloat. The maximum rate of fire of AU-220M - 80 shots a minute, range of fire — up to 14,5 km, a unit of fire - 80 shots. In a unit of fire the multipurpose fragmental and demolition, armor-piercing and operated shells. With the gun the machine gun of caliber of 7,62 mm is coupled to a unit of fire in one thousand cartridges. The module has a possibility of rotation by 360 degrees on the horizon. I saw this on the internet... and I liked it! Maximum range of damage - 6 km. The maximum height of the lesion is 4.5 km. The rate of fire is 120 rounds per minute. Full ammunition - 148 shots. The vertical guidance angle is 5 deg / +75 deg. Angle of guidance horizontally - 360 degrees. 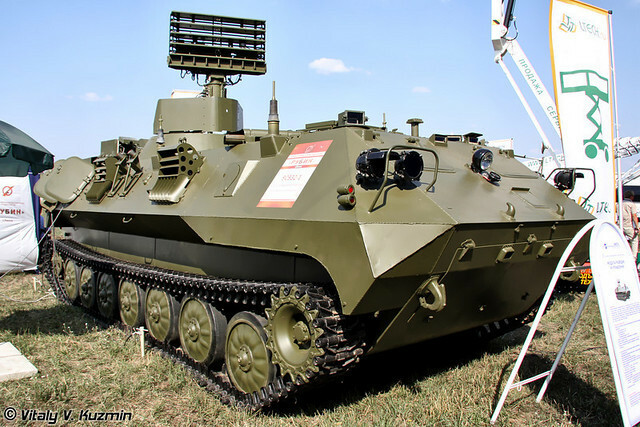 The combat vehicle 2S38 is equipped with an optic-electronic system for detection and targeting of OES OP, the development of Minsk OJSC "Peleng". It allows you to carry out panoramic observation of the terrain by 360 degrees, as well as to conduct a sectoral survey. Detection range through one of the television channels of a small unmanned aerial vehicle of the Bird Eye 400 type in the survey mode is declared at 700 m, in the narrow field of view - 4900 m. The A-10 attack aircraft is detected in the first mode already at a range of 6400 m, and in the second - at 12,300 m. The thermal imaging channel makes it possible to detect targets with a size of 2.3 × 2.3 m with a probability of 80% at a range of 10,000 m and recognize them at a distance of 4,000 m.
In the comments someone asked an important question: does it link in to other parts of an air-defense setup -> can take cue/target designation from a command vehicle or is it independent? Seems to be specifically being referred to as an anti-air vehicle rather than a fire-support/IFV with good AA ability so I guess its going to be a lot more rare than I'd like to see. Hoom: "Oh boy Army2018 is a big ol 57mm fest"
Yeah, a lot of long and thick… barrels this year. A real sausage party. They should put up some T-72´s to counter it. hoom wrote: In the comments someone asked an important question: does it link in to other parts of an air-defense setup -> can take cue/target designation from a command vehicle or is it independent? In an air defence role the vehicles will be capable of operating alone, but will be grouped in batteries of 4 or 6 vehicles, together with a command vehicle. 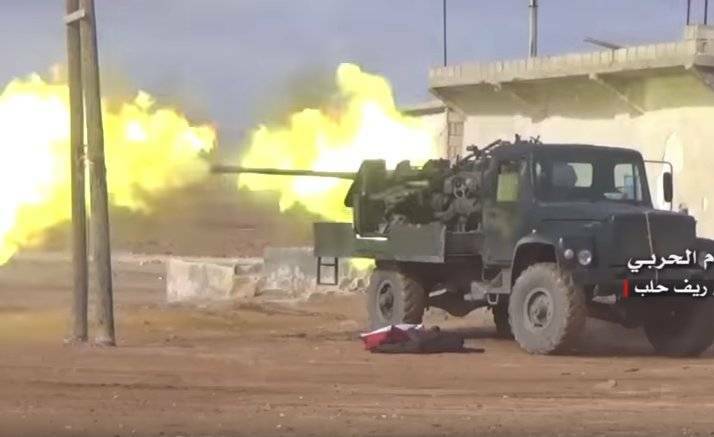 Guess that AA-specific vehicle would not be the T-15 but some lighter, cheaper one with more ammo. Any idea on the performance difference the muzzle brake makes? I definitely understand the firepower value of the 57mm I have been hoping this would be some kind of fire-support vehicle with handy secondary AA ability & which would be wide-spread in regular units but all the references to the BMP3 based Derivation call it an AA vehicle which implies being more rare, specialised vehicle.